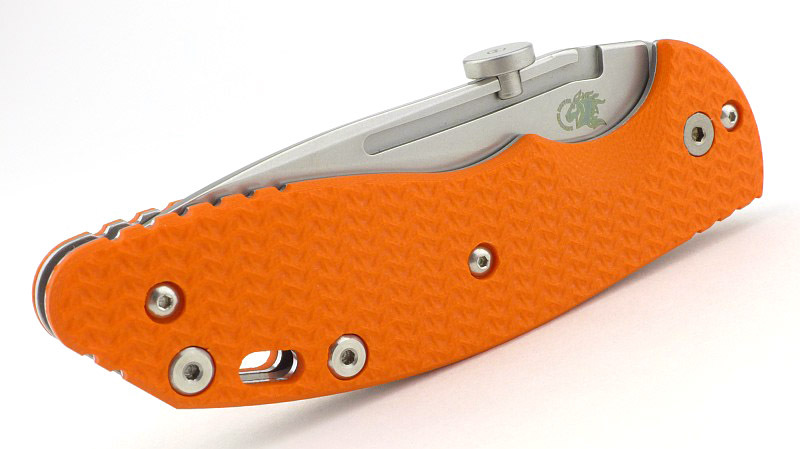 Hinderer Knives’ XM-Slippy was designed to answer the high demand from the European market for a Rick Hinderer knife that could be carried in areas with more restrictive knife carry laws; as its name suggests, it is a slip-joint knife. The knife was debuted at IWA 2017 and is currently entering into its second production run. 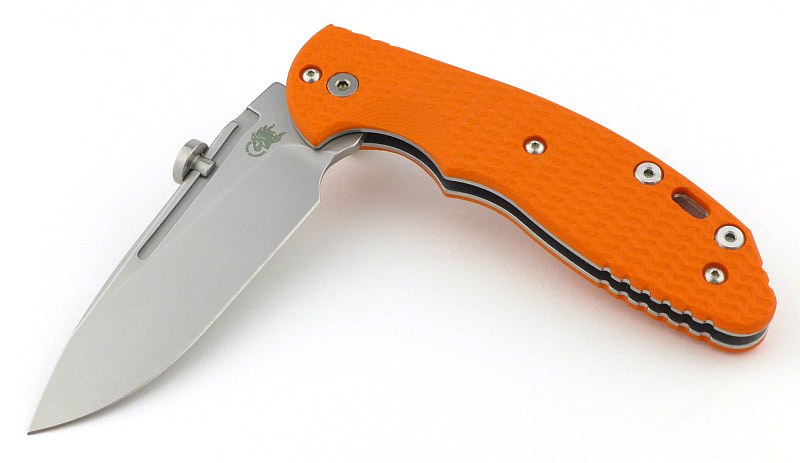 The XM-Slippy shown in this review is a first run knife and externally there is no visible change when compared to the second run. 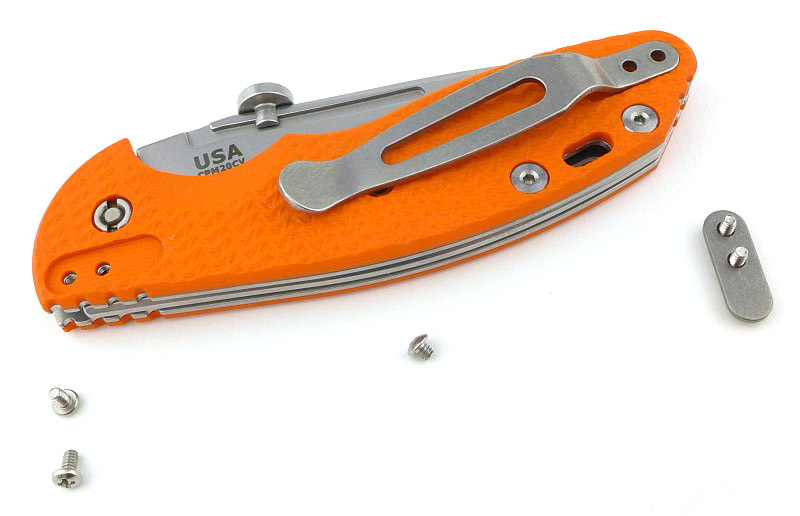 Designed to be as universally EDC legal as possible, the thumb disc can easily be removed for two-handed opening if required. 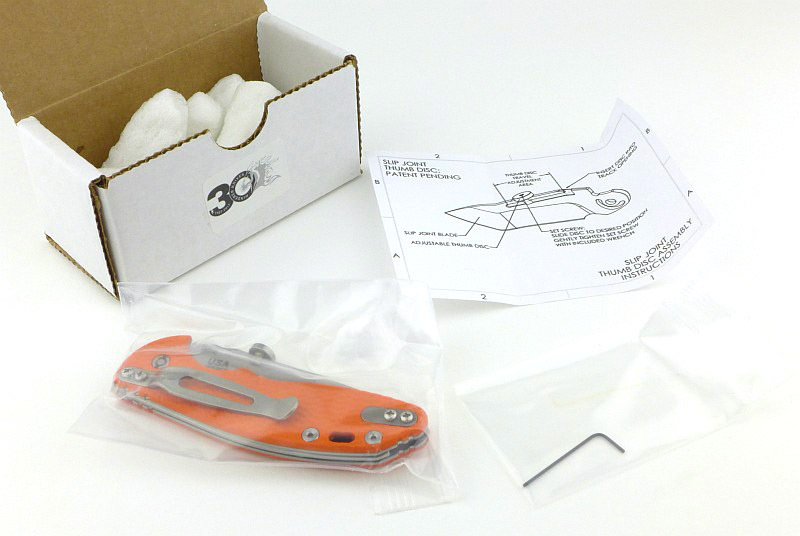 In the box is the XM-Slippy in a plastic bag, along with a small Allen key and instruction sheet for the re/movable thumb stud. 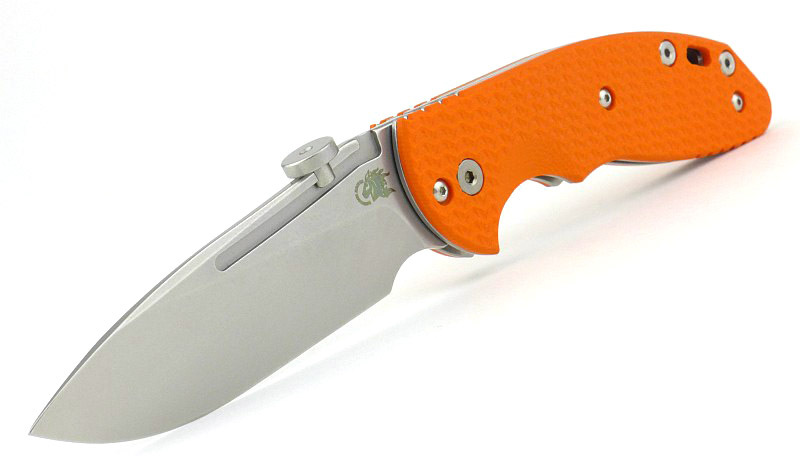 This example has the VERY orange G10 handles, but the XM-Slippy is also available in much more neutral colours. 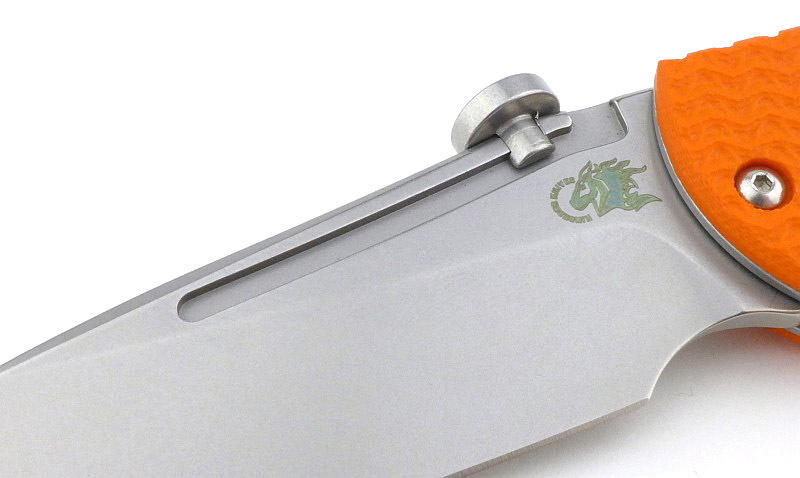 The stonewashed steel pocket clip is fitted by default in the tip down position and is pretty thick and sturdy (also read ‘stiff’). One design aspect needs a little more attention; the smoothing/easing of all edges. A very obvious example of this are the edges of the back-spring, and the bevelled edges provide shadow lines along the back of the handle. 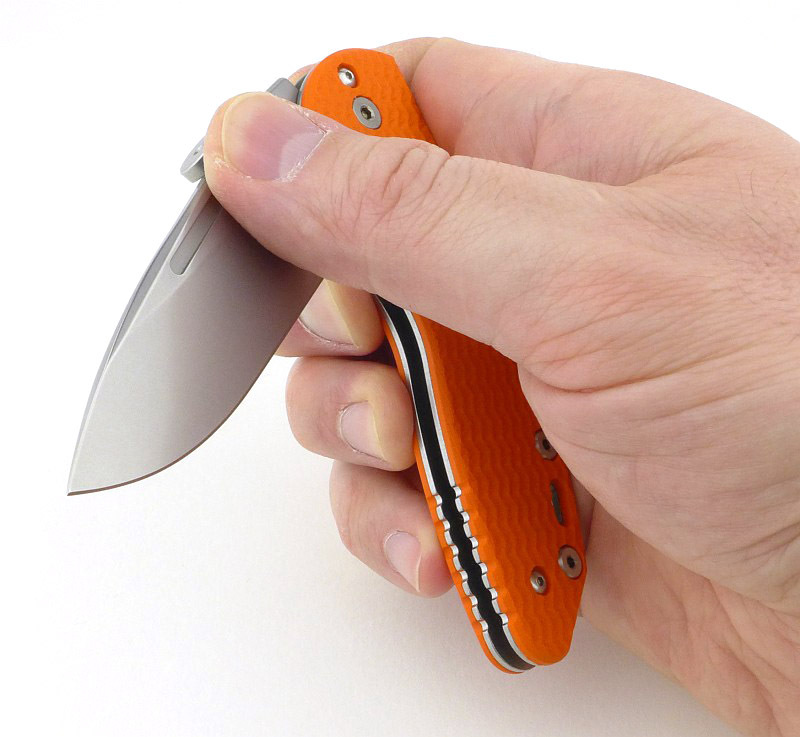 The fact all edges are eased/rounded gives it a distinct look and feel and a great comfort in the hand and pocket. Some might criticise the fact that the H doesn’t look as tight as they would expect, but this is as it should be; the combination of the easing and the fact there is an internal stop-pin results in this appearance, the blade itself is spot on and perfectly positioned. Peering into the liners, you can see the very end of the clip screws just coming through the liner, but there is no contact with the blade; it does mean the screws are as stable as they possibly could be as they fill the threaded hole completely. 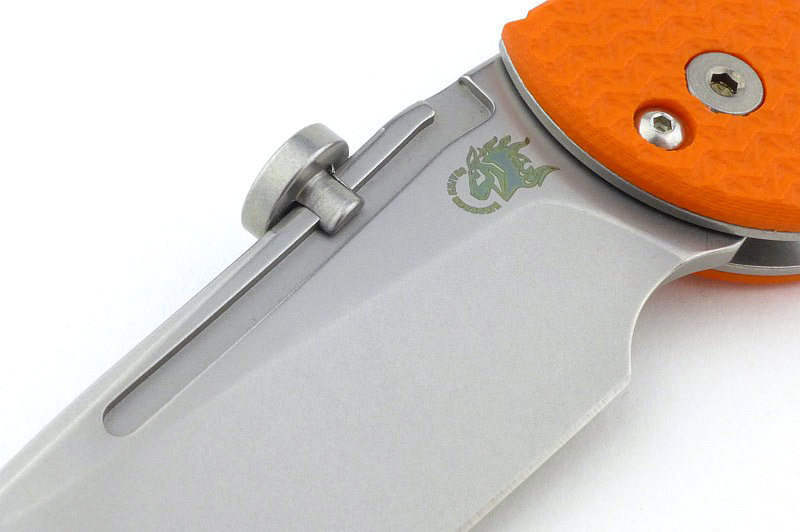 The Hinderer logo - always a good thing. 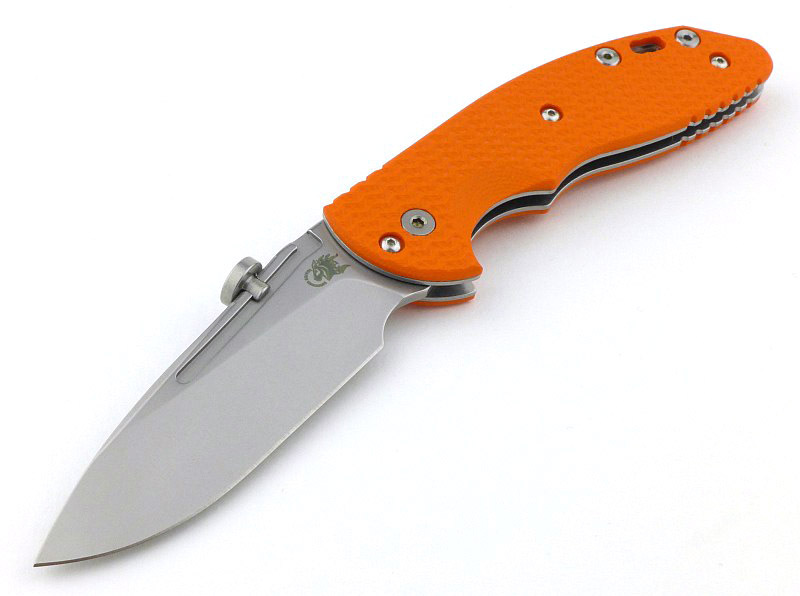 This example has the very orange G10 handles. 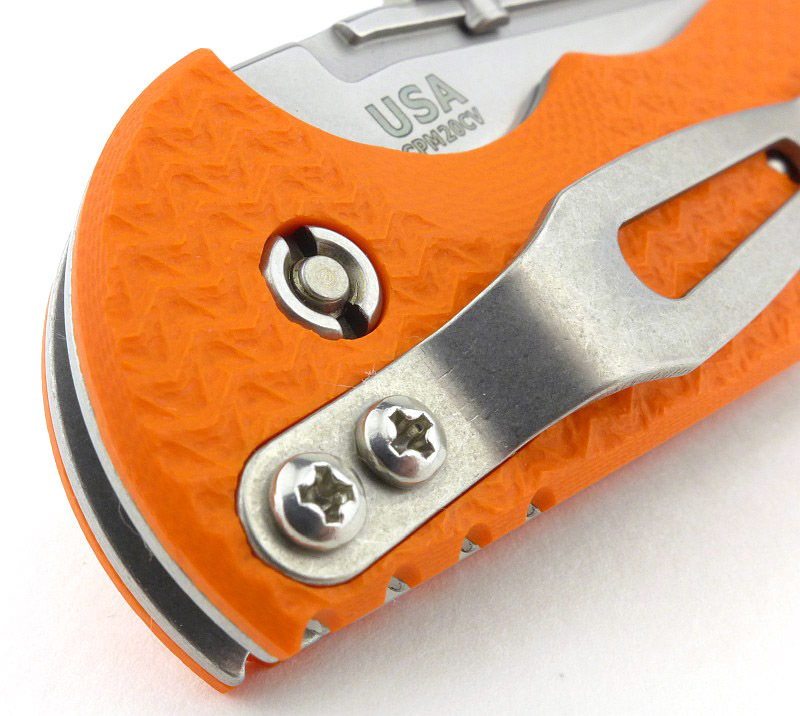 A stonewashed steel pocket clip is fitted by default in the tip-down position. 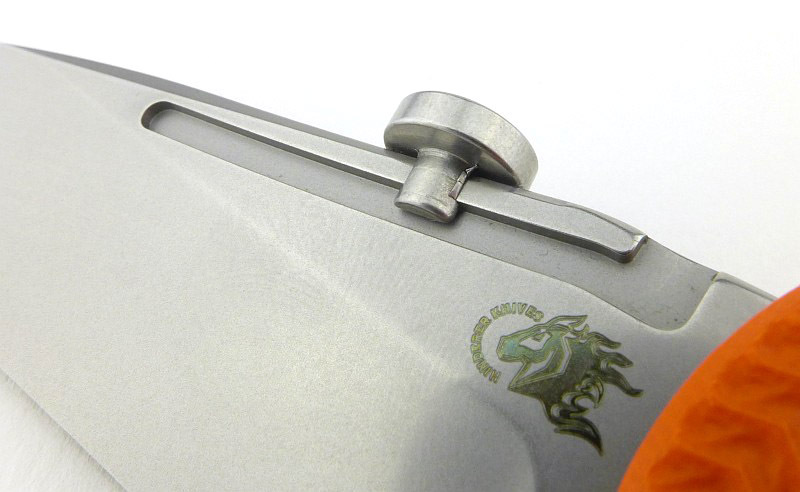 The tip-up clip position has a blanking plate fitted. 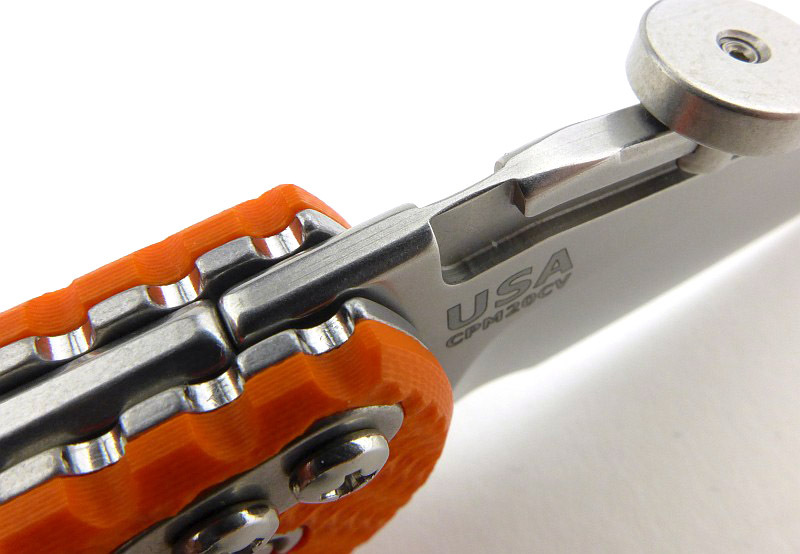 On the clip side of the pivot bolt, the nut is flush and uses a 'security' style two-slot design. The pivot uses an Allen head bolt. All edges of the back-spring are eased/bevelled providing shadow lines along the back of the handle. A closer look at the back-spring and the jimping for a reverse grip. Jimping on the handle goes through the liners and G10. Peering into the pivot, you can see the phosphor-bronze washers and the very end of the clip screws just coming through the liner. 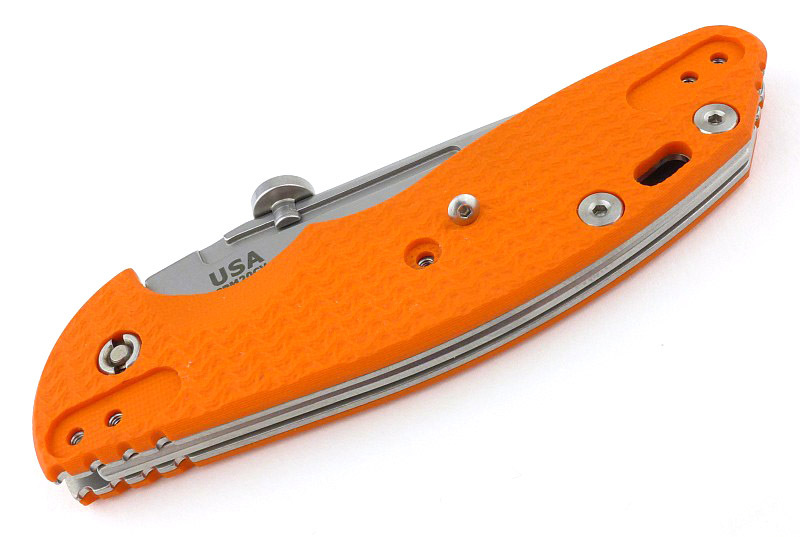 The clip is made from thick steel and is very sturdy. 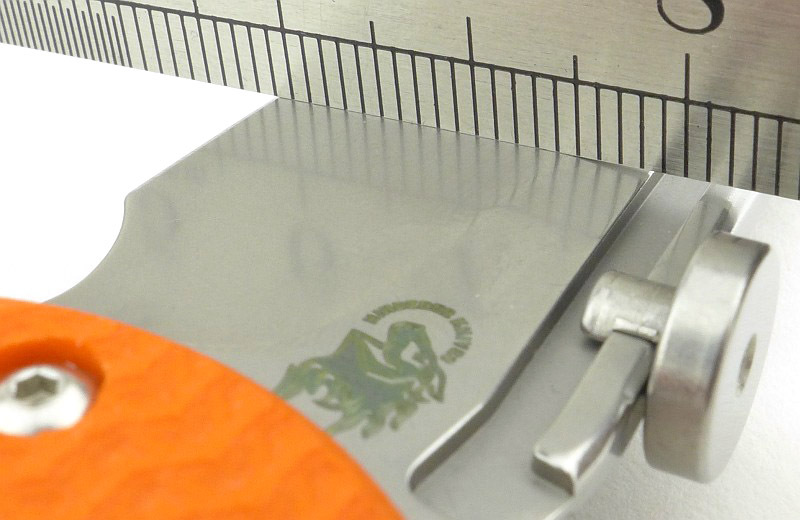 A wide finger/sharpening/safety choil spans the smooth plunge line. By intent, all edges are eased/rounded giving it a distinct look and feel. The combination of the easing and the fact there is an internal stop-pin means the H doesn't look as tight as some would expect, but it is as it should be. 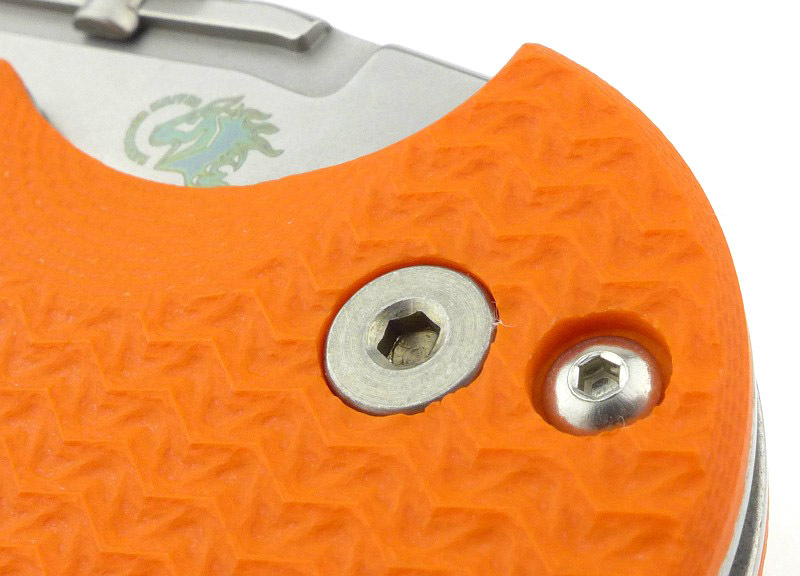 The Hinderer adjustable thumb disc uses a small grub screw (0.035″ Allen key) to secure it in place. 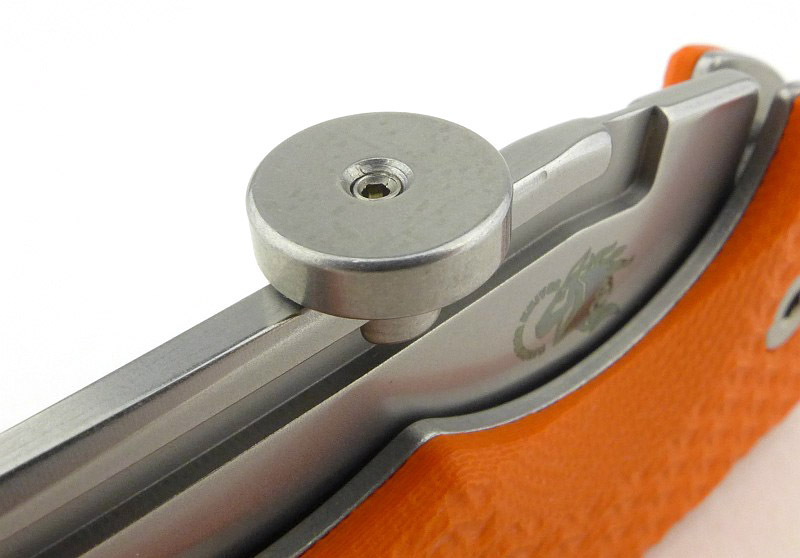 The Thumb Disc channel is the same on both sides of the CPM20CV blade, forming a T-shaped section that the thumb disc slides onto. The thumb disc can be positioned anywhere along the channel, or removed, allowing the user to find the best location for them. 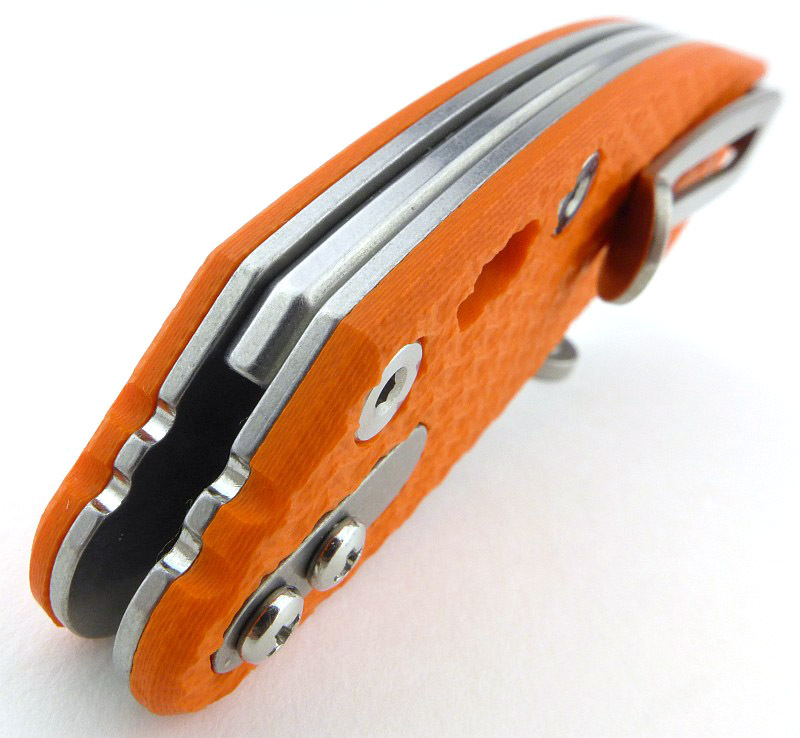 The Hinderer adjustable thumb disc. 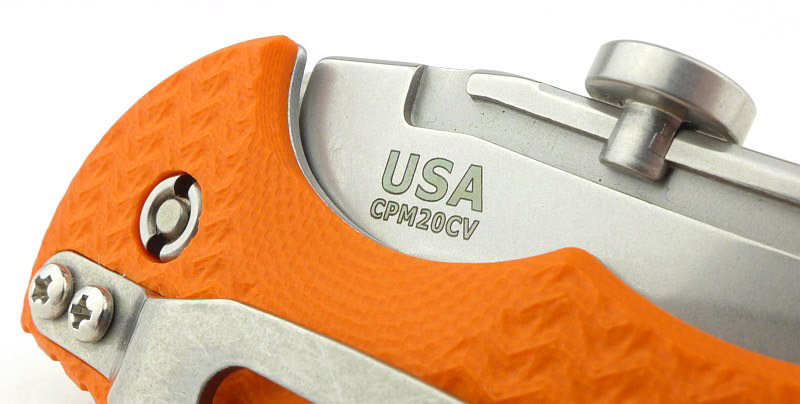 The Thumb Disc channel is the same on both sides of the CPM20CV blade. Looking at the top of the disc you can see the small grub screw used to secure it in place. 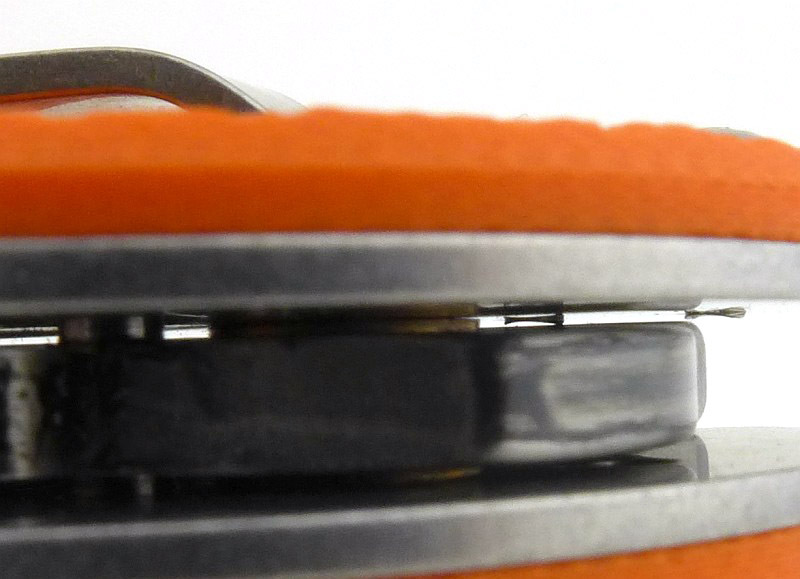 The Thumb Disc can be positioned anywhere along the channel, or removed. This allows the user to find the best location for them. 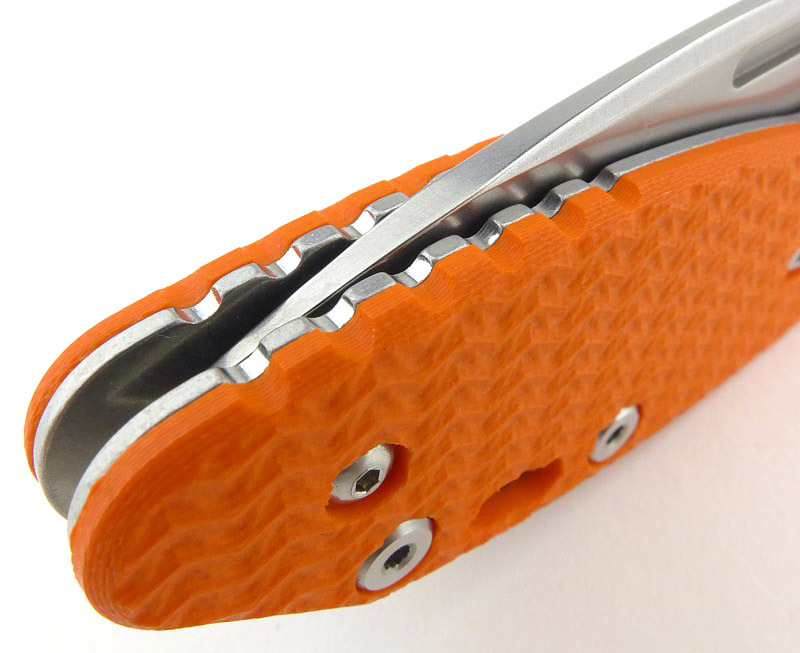 The channel on each side of the blade forms a T-shaped section that the thumb disc slides onto. Using the 0.035" Allen key provided, the thumb disc position can be adjusted. 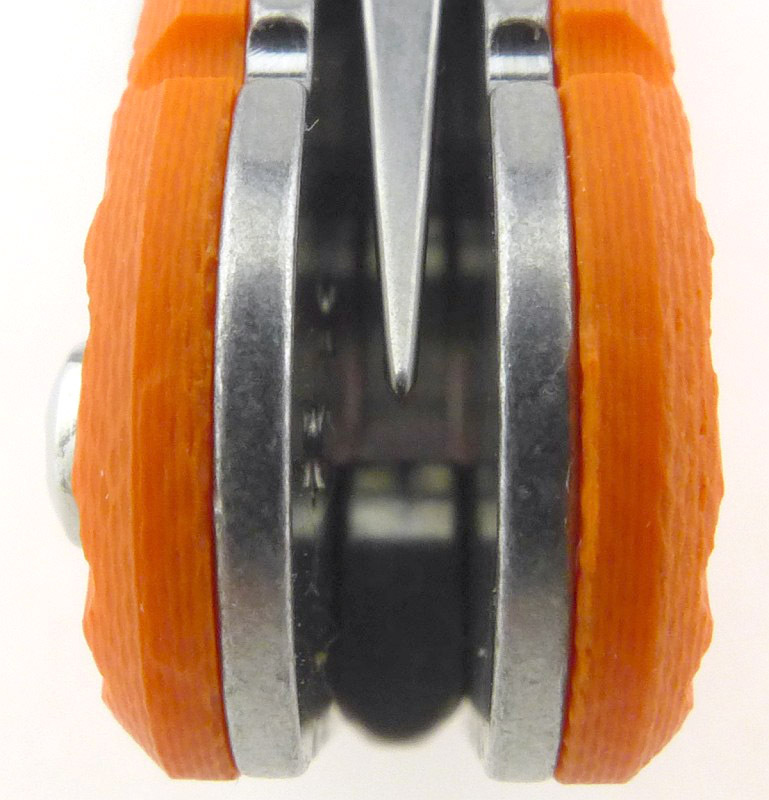 A close look at the thumb disc when taken off the knife. With the shape of the channel, this is realistically one extreme position the disc can be located. Moving to the other extreme position. If you need to disable OHO or prefer the look without the thumb disc you have the choice as the thumb disc can be completely removed. 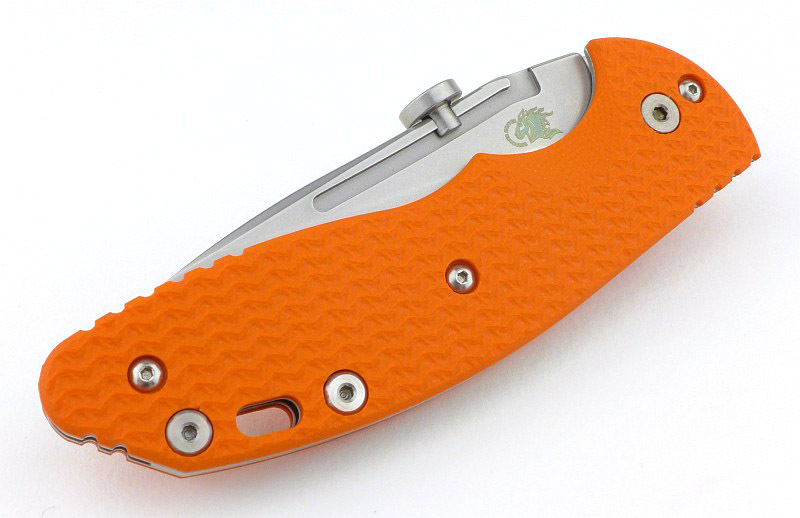 The thumb disc slot also acts like a large nail-nick giving you something to grip to open the blade. 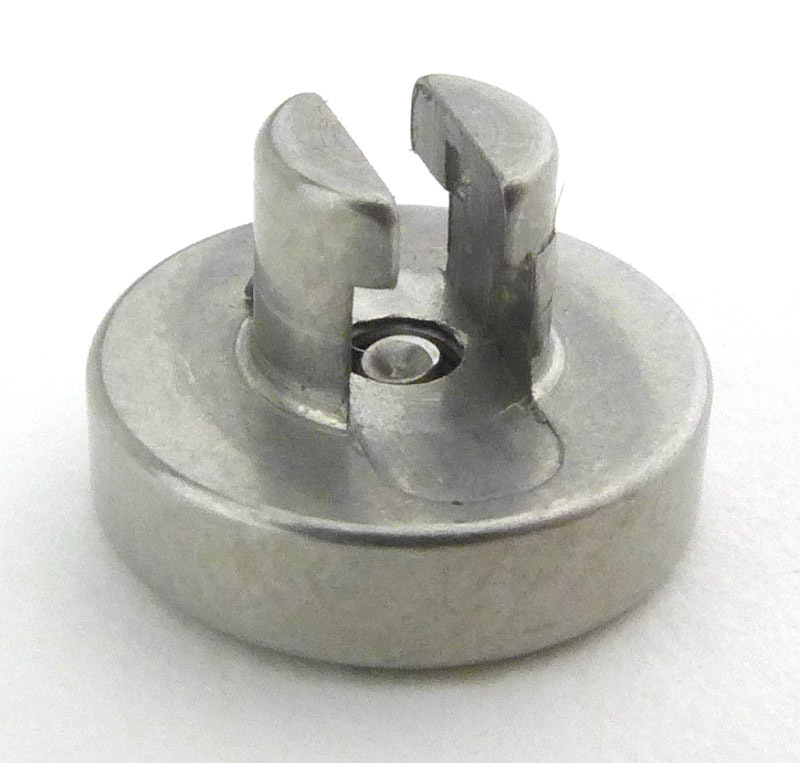 Using the 0.035" Allen key the thumb disc can be completely removed. If you need to disable OHO or prefer the look without thumb disc you have the choice. 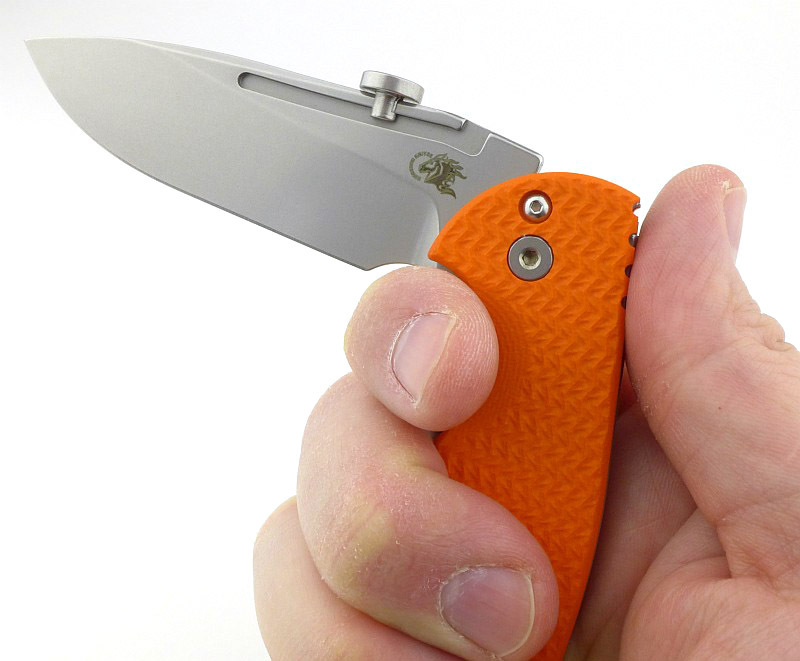 The thumb disc groove also acts like a large nail-nick giving you something to grip to open the blade. 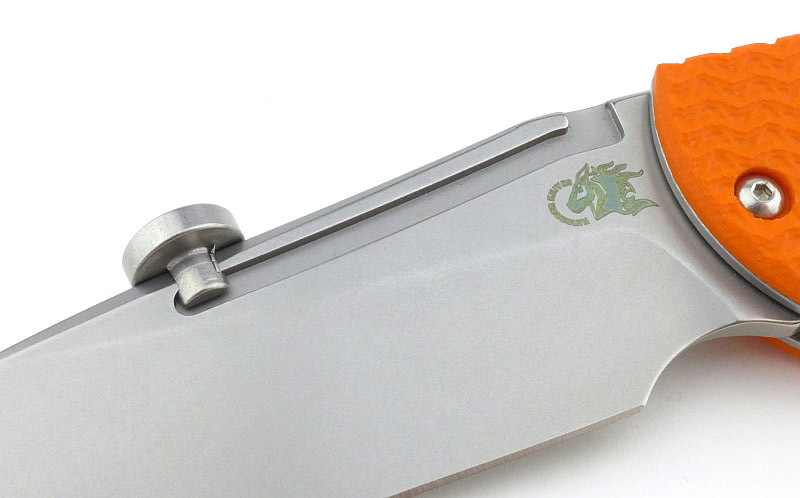 While at IWA 2018 I had the good fortune to be able to talk to Rick Hinderer about this knife. 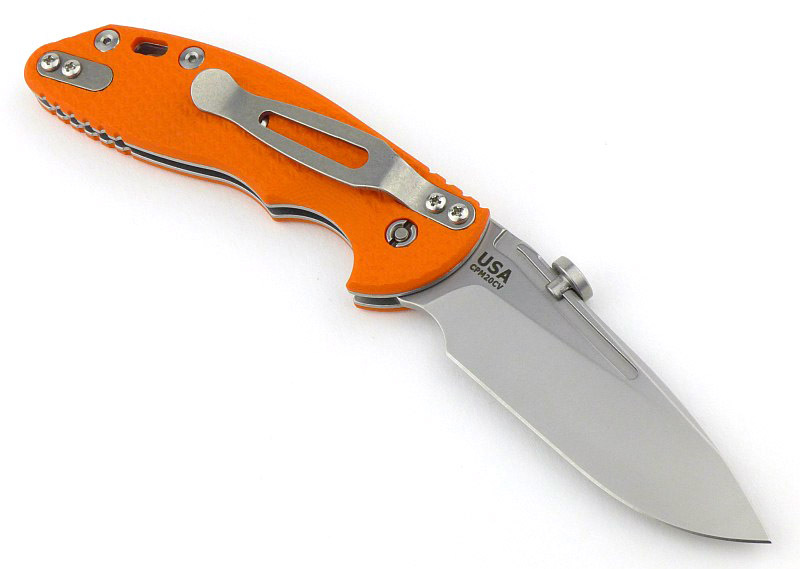 The blade is made from CPM20CV steel. 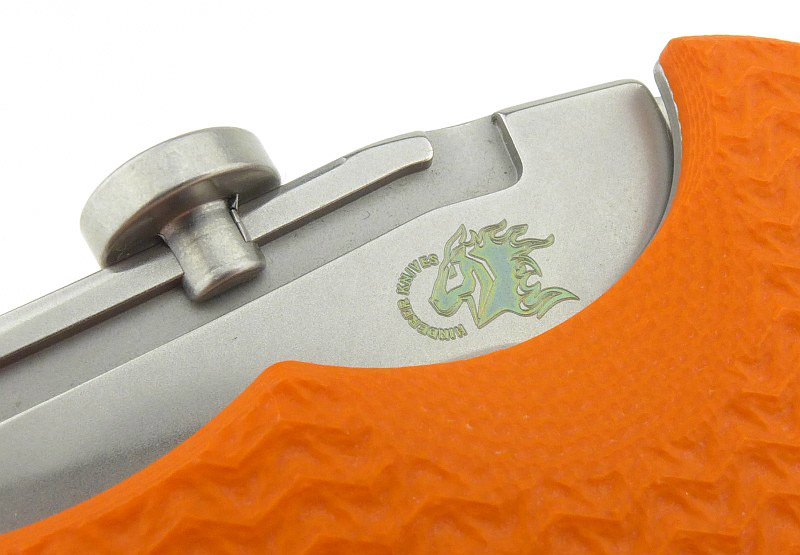 The XM-Slippy’s factory edge has an average BESS ‘C’ sharpness of 399. This was a show exhibit knife, so I would not comment on the absolute sharpness after all the handling and trying out it has had. As it was, the edge didn’t appear to have any rolling or damage, and with this edge would slice 80gsm well enough although not the cleanest of cut. 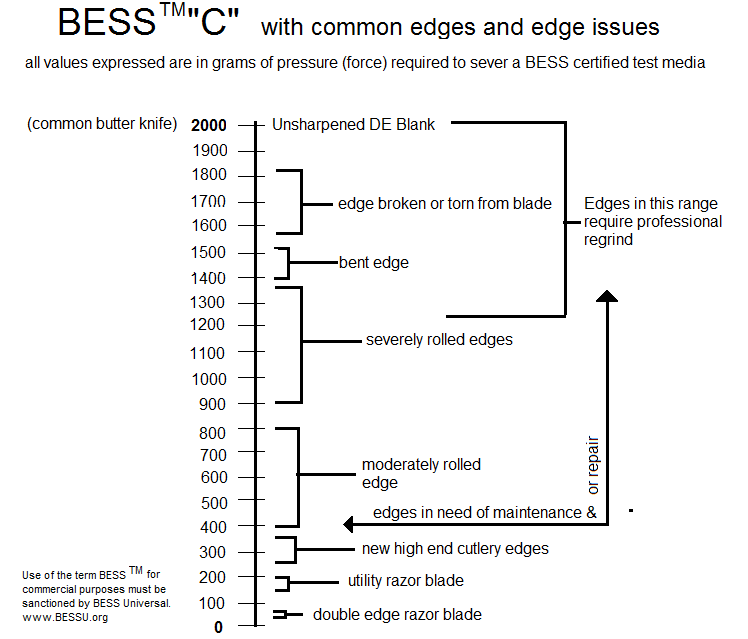 For testing I have taken the edge to a 30 degree inclusive angle and a BESS score of 200, at which point it is shaving arm hair with ease. There is a finesse to the overall finish which starts to sink in the more you use it. 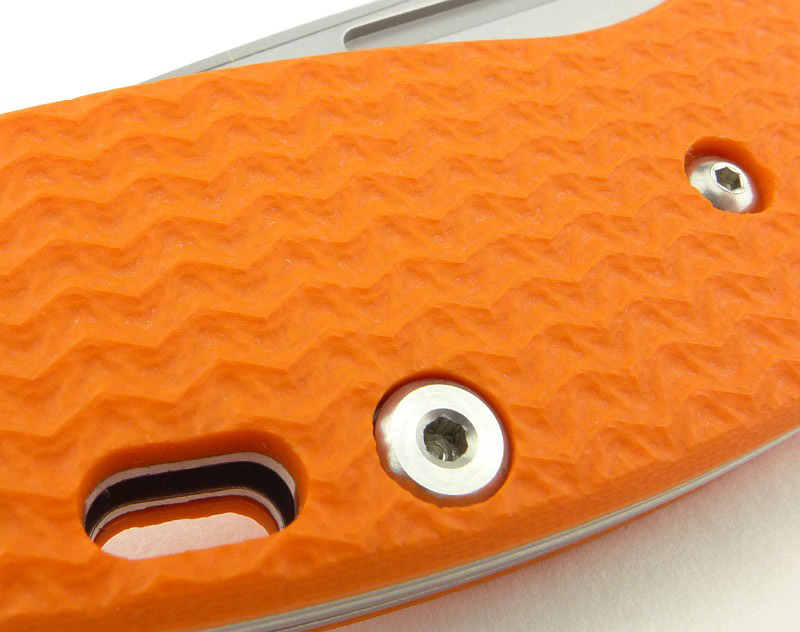 The XM-SLippy, has only one sharp edge, exactly where it should be. 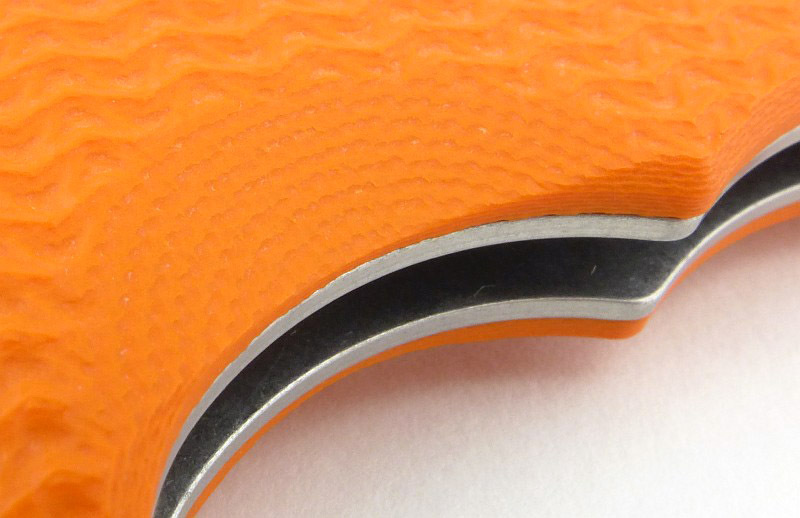 All the other corners are smoothed so that nothing catches on your hands, gloves or pockets. I cannot stress enough how much this adds to the quality feel as nothing ‘jars’ while you handle or use it. 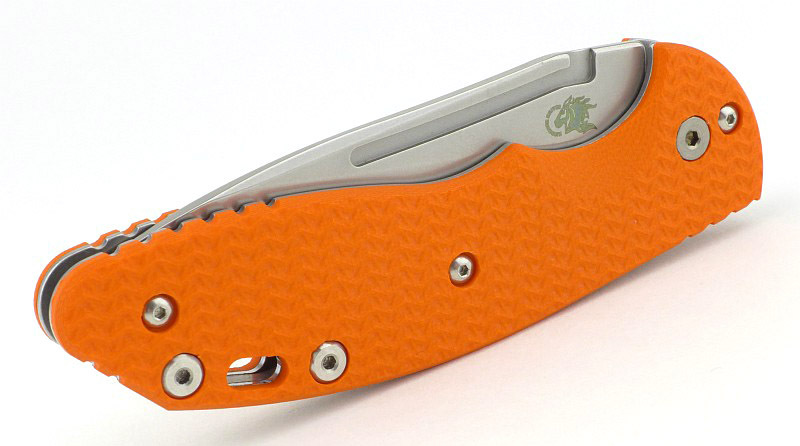 Some knives have an unrelenting crispness to their finish and this can mean that edges are sharp, the corners of liners, blade stop, back-spring etc, all of which can become fatiguing to your hands and pockets – not so with the XM-Slippy. 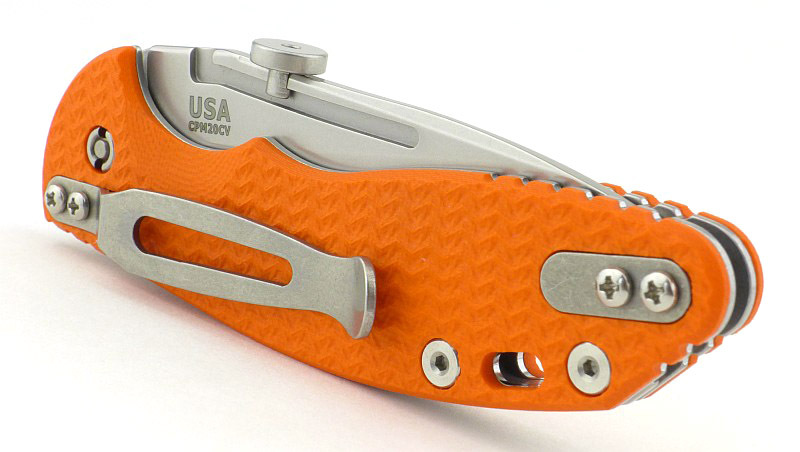 Many slip-joints use a half-stop position for the blade, and in a two handed opener I don’t object to this, but for a one-handed-opener, I find this a big no-no. 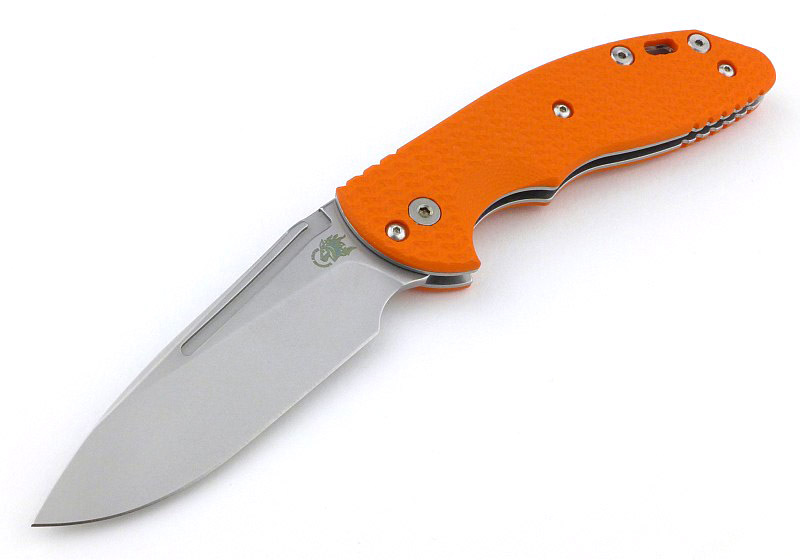 The XM-Slippy has no half-stop, so the blade swings out smoothly all the way to snap into the open position without interruption. 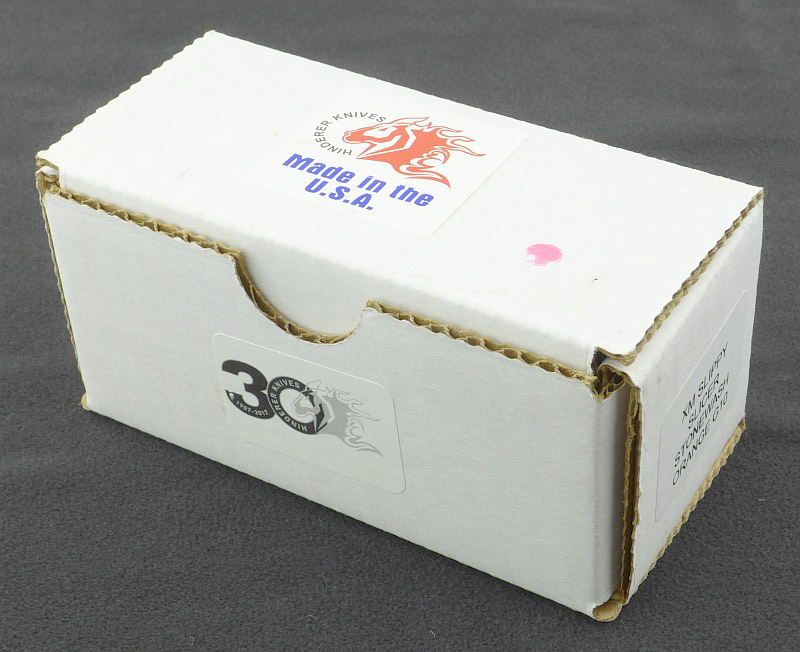 In my view this is exactly as it should be for a OHO, slip-joint or not. 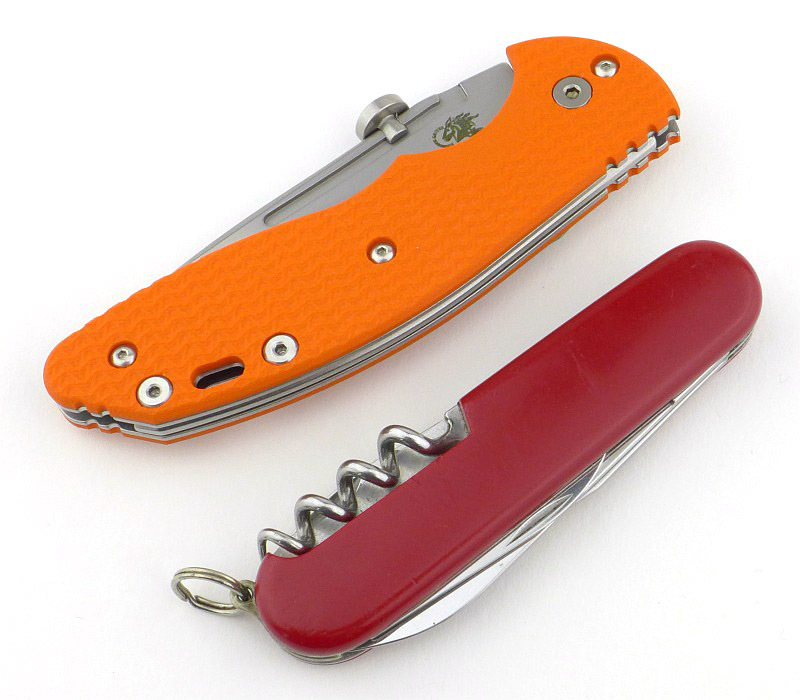 There are some that argue that the half-stop add to the safety in case of accidental closing, so the blade doesn’t close on your fingers. 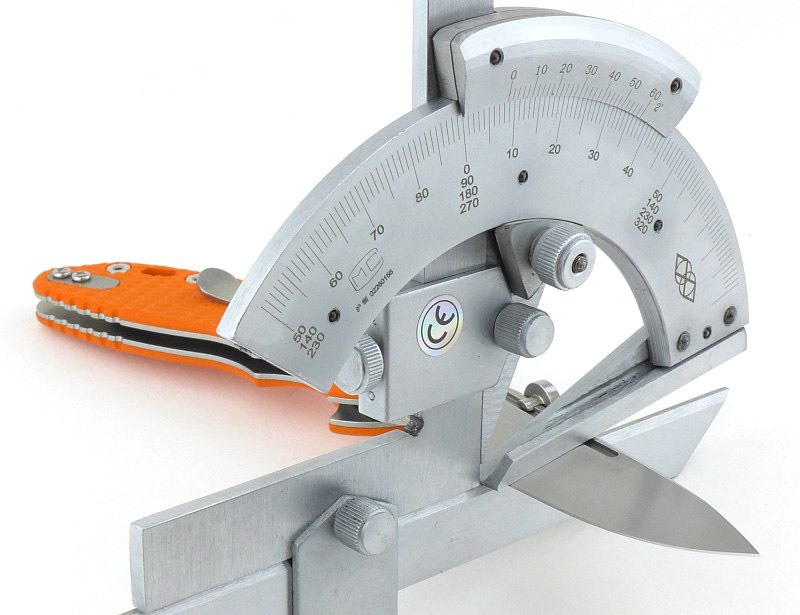 I’d counter that by saying that if your slip-joint is closing on you, you are not using it correctly, and if you have sufficient force to start closing the blade onto your fingers it is quite likely to keep going through a half-stop anyway. Rick has definitely got this right. A design feature shown in the gallery is the relatively large choil. This is not really a finger choil, though can be used as such carefully, and it is too large for a sharpening choil. 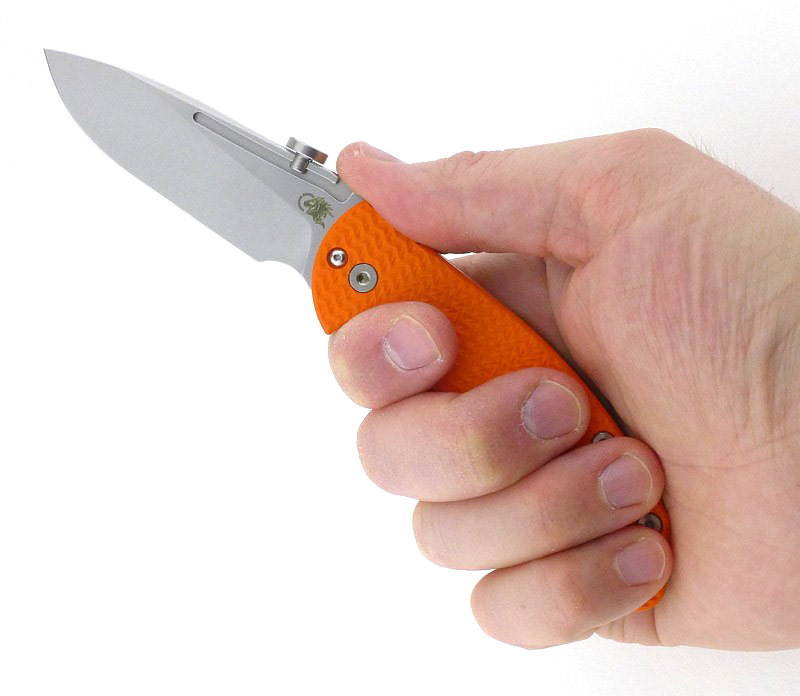 Instead its design purpose is so that if the blade is closed onto your fingers, it is the choil that actually hits your finger (see gallery) giving you some protection from injury. Being based on the XM platform, the look is of course familiar, but it also includes some jimping which might be a little overkill for a slip-joint. 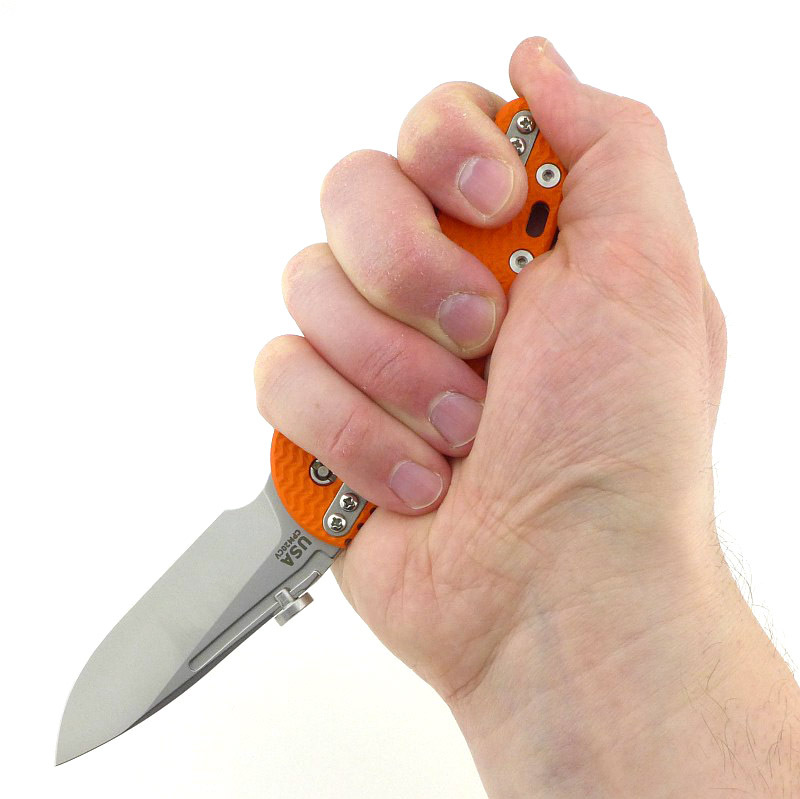 The forward thumb grip is useful, but clearly when applying a lot of force with a slip-joint you need to be careful. 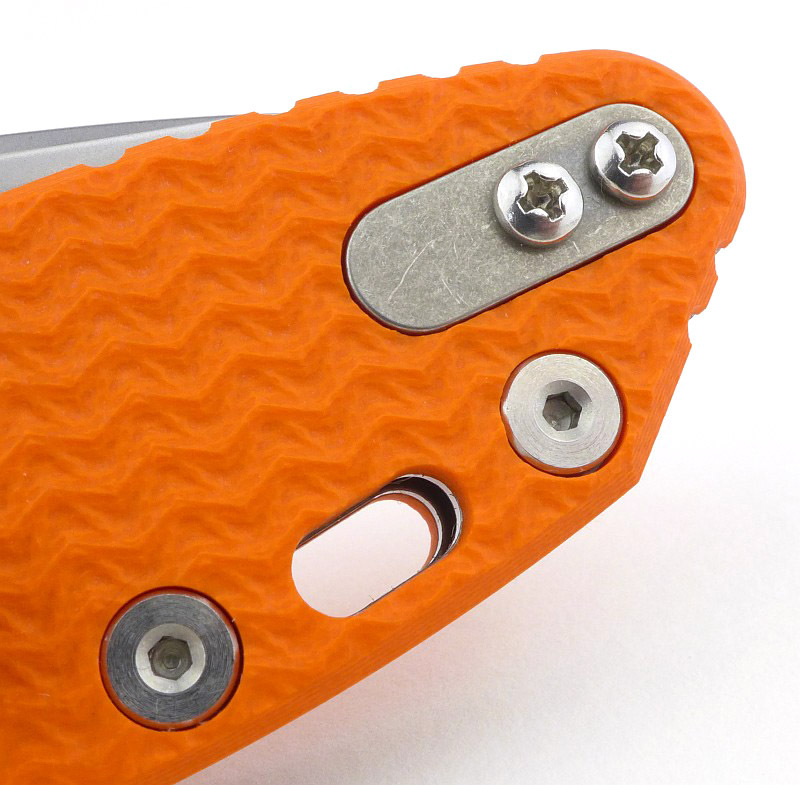 There is jimping for a reverse grip and I’d say it is wholly unsuitable to use a slip-joint with a reverse grip, so don’t take its presence as a suggestion to use the XM-Slippy like this. 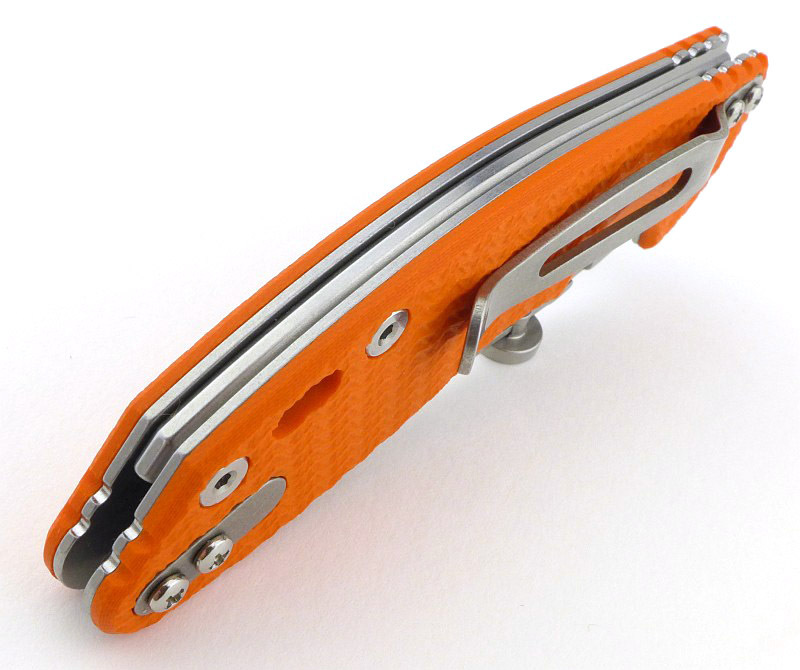 Rick has designed in easy user customisation for the XM-Slippy; starting with the pocket clip, which has two options, tip-up or tip-down. Keeping the refined finish complete, there is a blanking plate to fill in the alternate clip position, and swapping the pocket clip position is nice and easy. 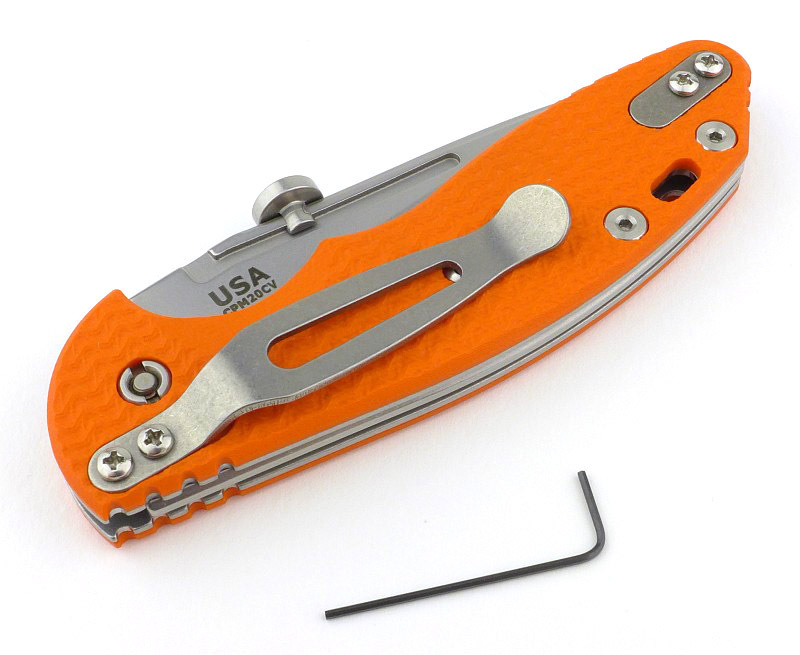 Using a standard Phillips screwdriver, simply undo the two screws holding the pocket clip and the two holding the blanking plate. Swap round and replace the screws…but wait, there is the next part. 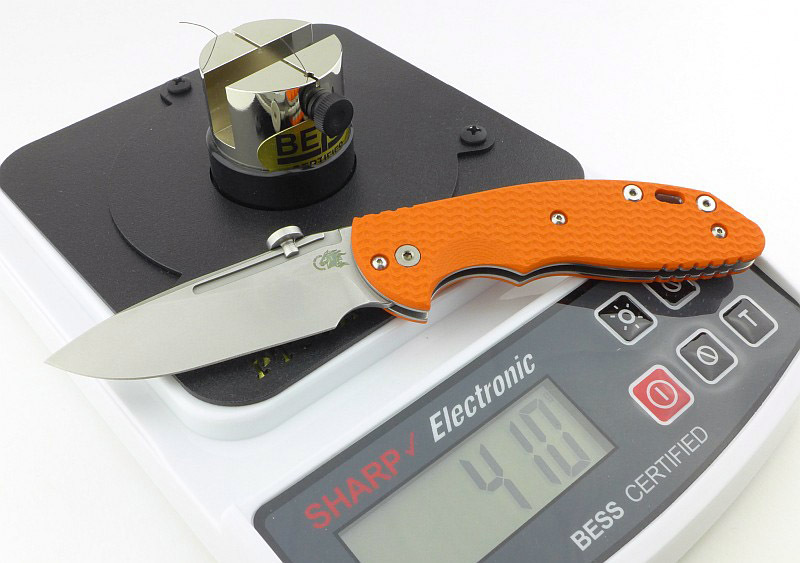 With the pocket clip off the knife, there is only a single screw holding the handle scale on. 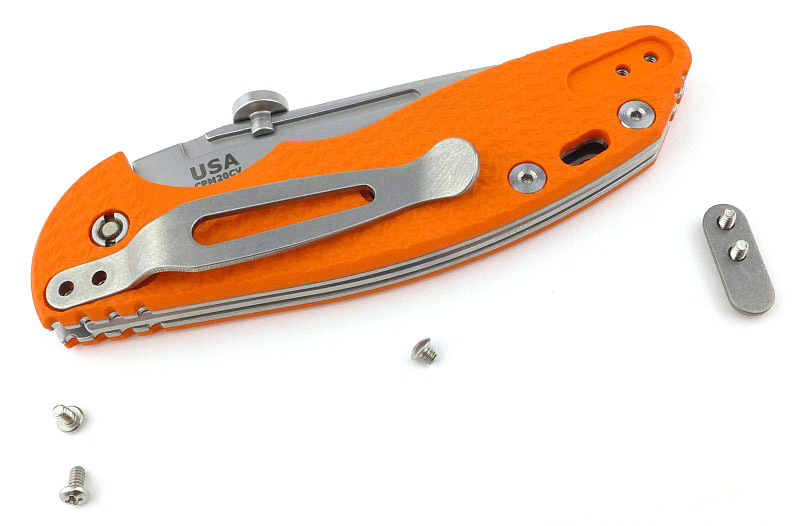 Take out that last screw and the G10 scale can be lifted off. Its fit is beautifully precise. 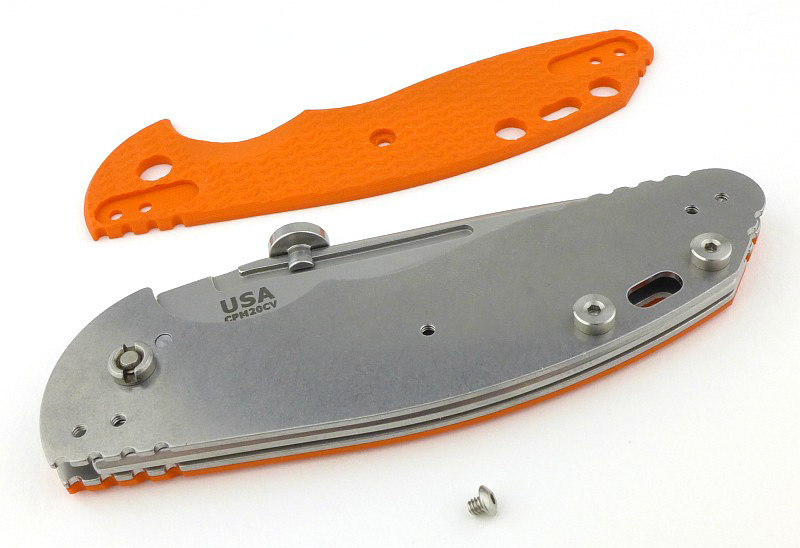 A nice feature when swapping the handle scales is that with the scale removed, the knife is still fully functional, as the liners are held together with other fixings. 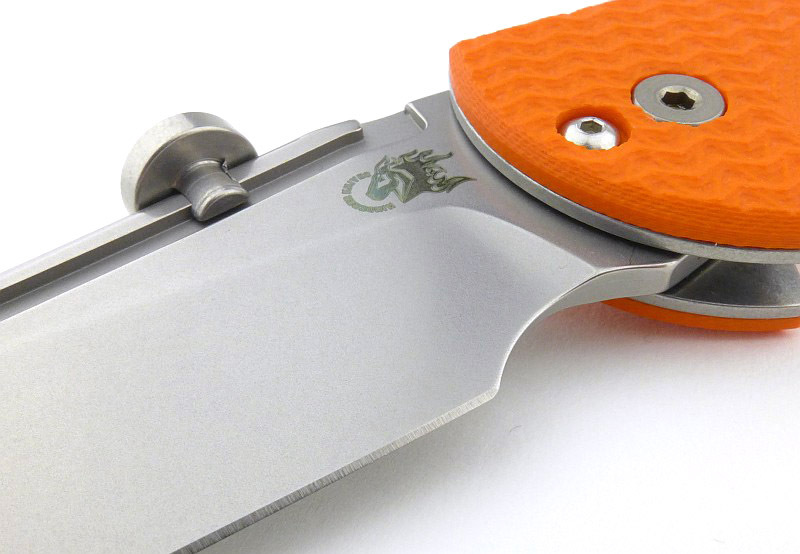 This example is fitted with the Hinderer ‘slicer’ blade which is an excellent general purpose blade shape for an EDC knife. 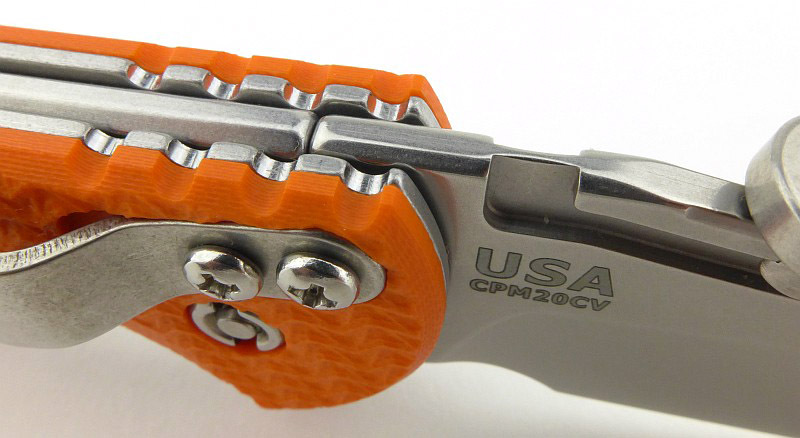 Is the adjustable thumb disc a gimmick? Maybe, maybe not. 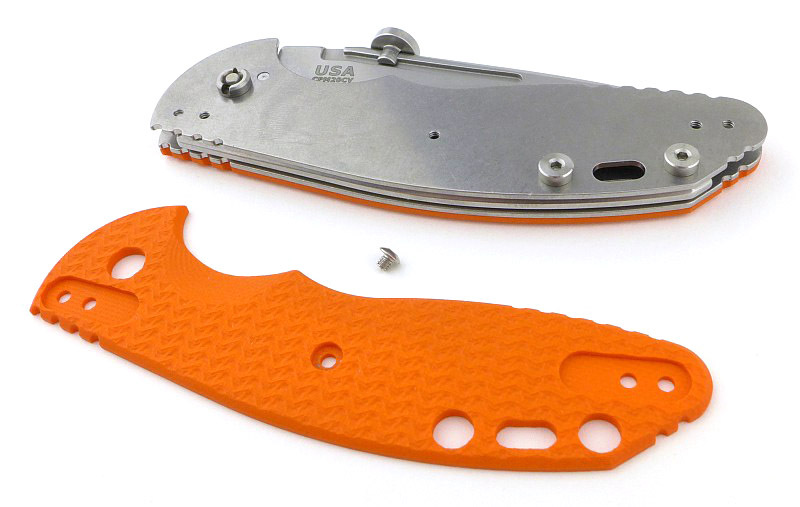 Though I can never see the extreme positions you could put the disc being used by anyone, the length of the thumb disc slot looks right for the proportions of the blade. 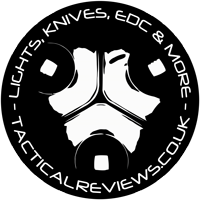 Even small adjustments can make a big difference for your experience of using the knife, so don’t be afraid to move it about and try. 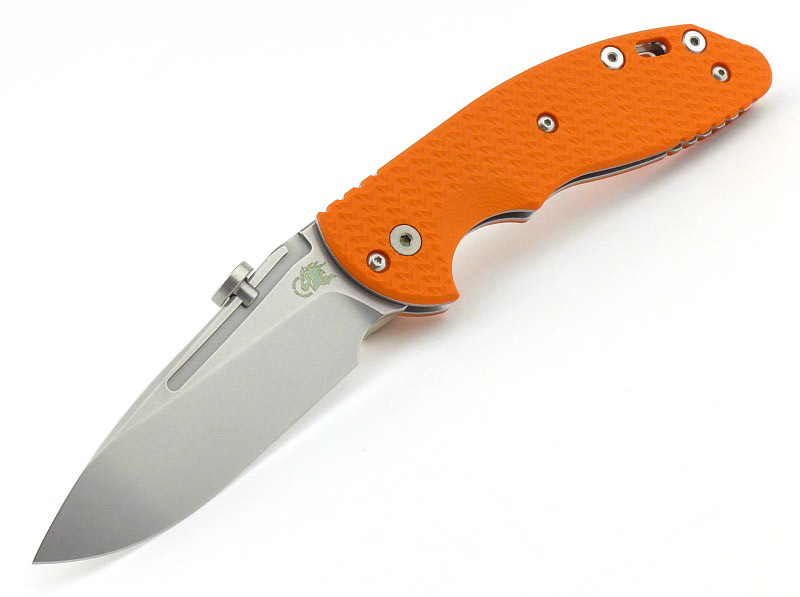 I’ve settled on a position that is different to all my other knives with thumb stud /disc. Then of course you can take it off, if you are visiting an area where the law does not permit one-handed-opening. I have found the thumb disc slot does collect a bit of pocket dust, but nothing compared to a pivot or the handles, so not to worry, and anything other than a perfectly plain blade will fail the ‘peanut butter’ test anyway. The factory/show edge needed attention before I started to really use it, and the CPM20CV proved to be very easy to sharpen and took a razor edge with very little work. 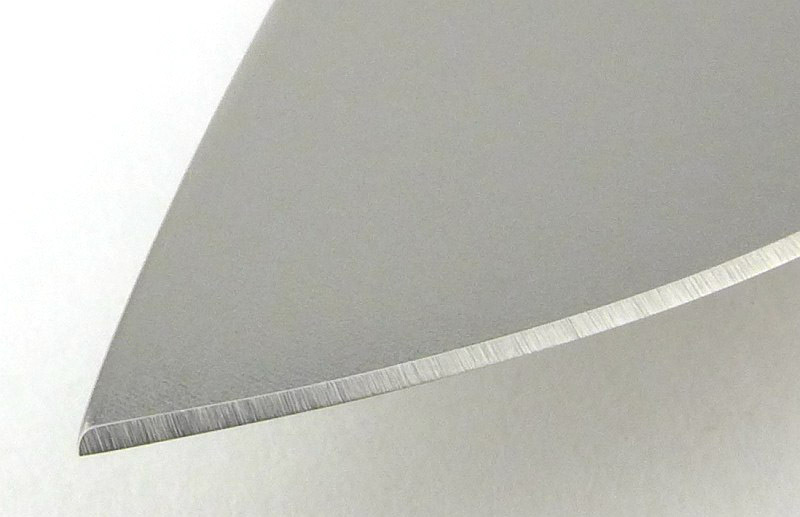 My current sharpening method is to use a small belt sander (120 grit with a light touch) with bevel angle guide to reprofile to 15 degrees per side followed by a good stropping with a polishing compound, the edge on this blade simply wanted to be super sharp. 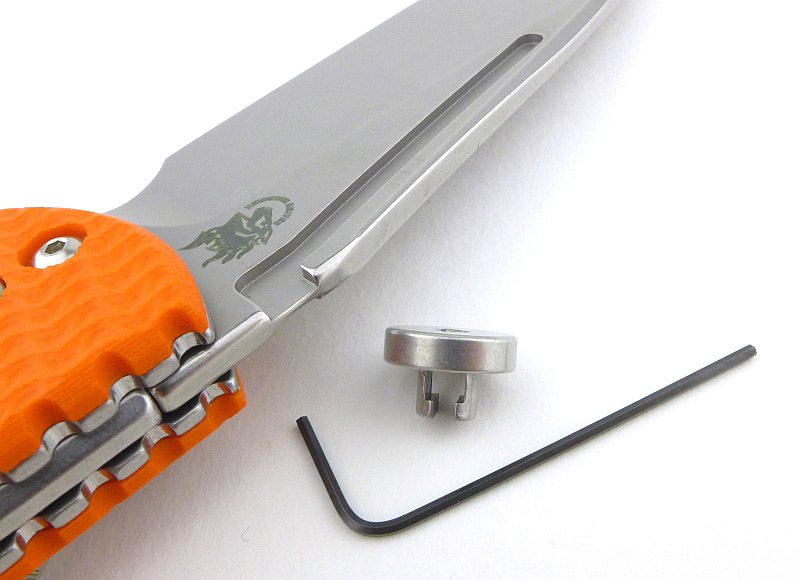 The large choil provides a degree of safety if the blade closes by mistake. 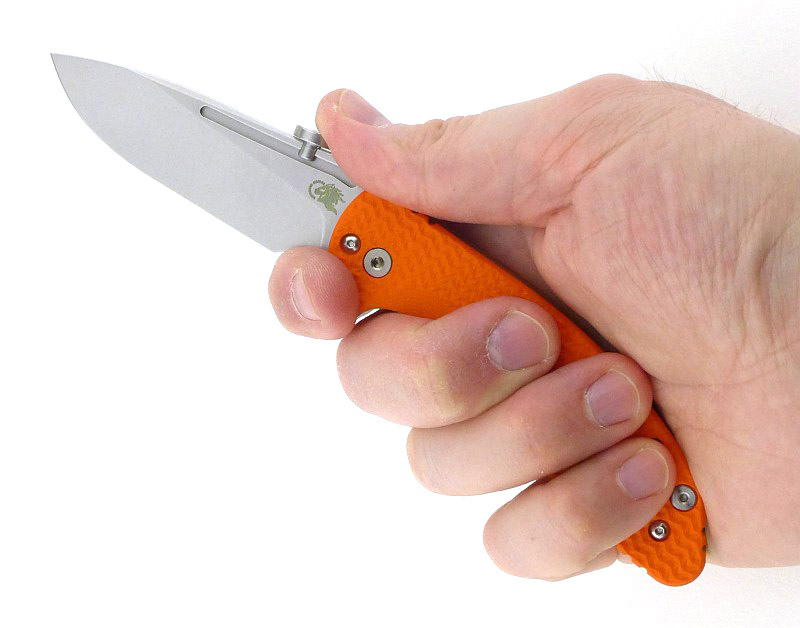 It brings the cutting edge away from the finger as shown in the half-open position. You can move slightly further forward to utilise the choil. Not really suitable use for a slip-joint, but the reverse grip has jimping for the thumb. Swapping the pocket clip position is nice and easy. With the blanking plate removed the clip fits in perfectly. Like this, the handle scale can be removed. 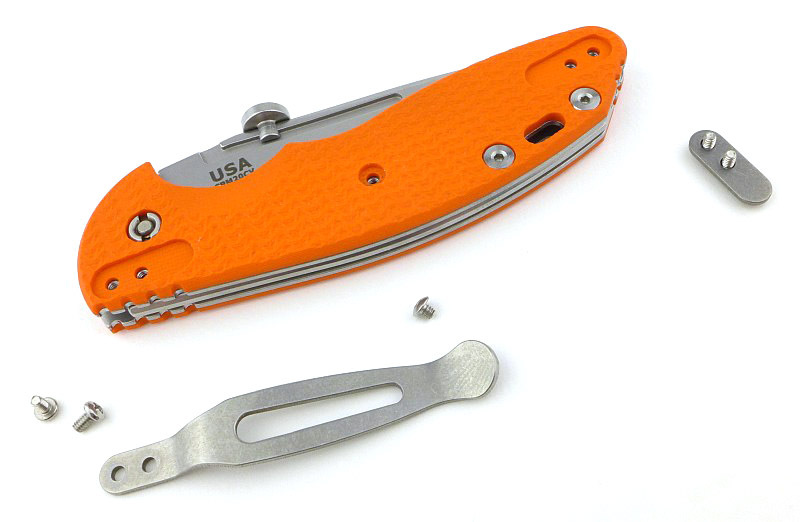 With both the clip and blanking plate removed, there is only a single screw holding the handle scale on. 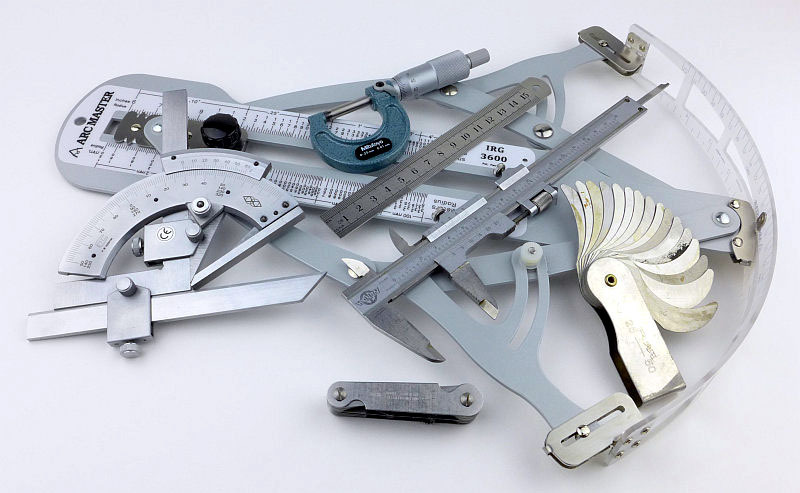 The handle scale is beautifully precise in its fit. With the scale removed, the knife is still fully functional. 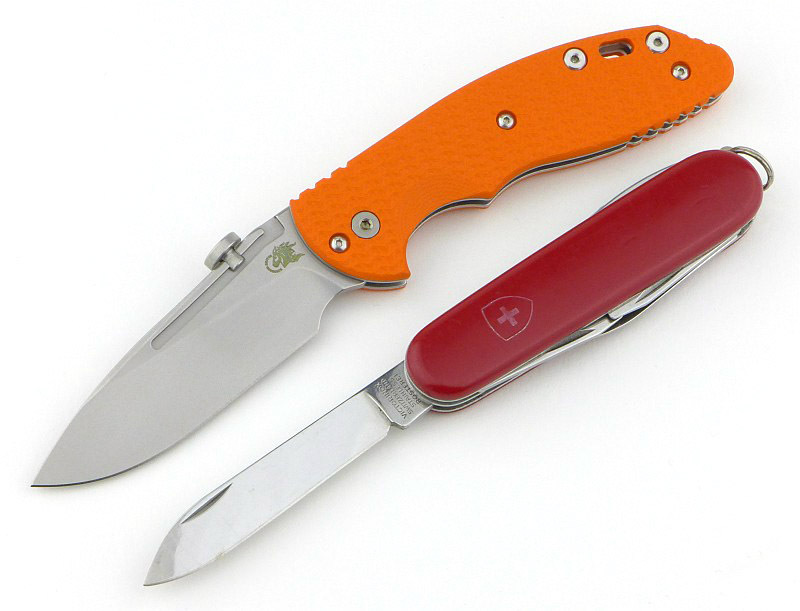 To give an idea of scale, here it is next to a standard Victorinox. High quality fit and finish. 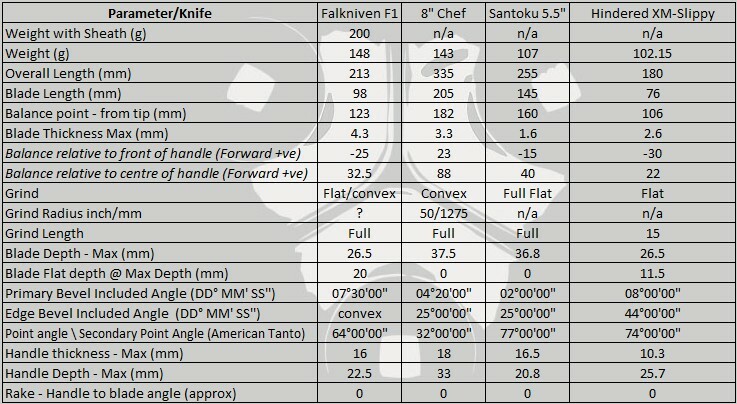 Expensive when compared to most slip-joint knives. 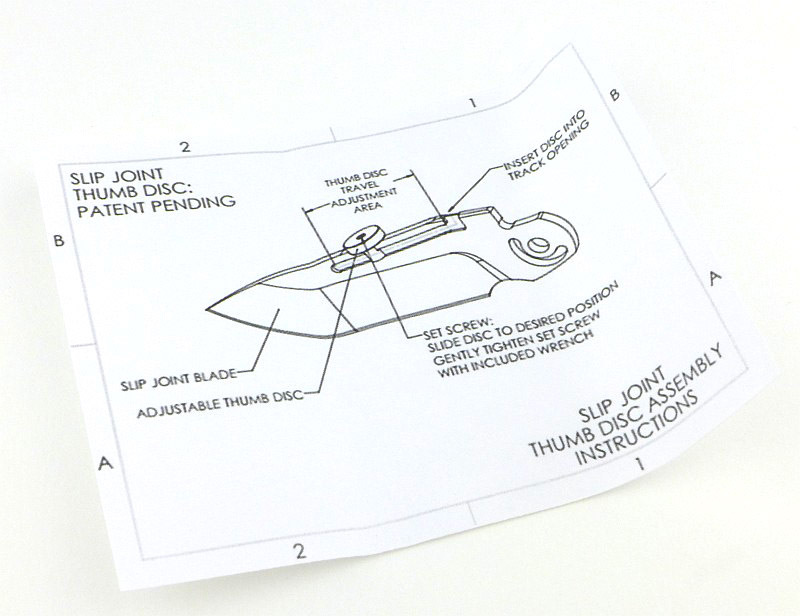 Adjustable / removable thumb disc. Pocket clip a bit tight for my taste. All edges smoothed making it especially hand and pocket friendly. 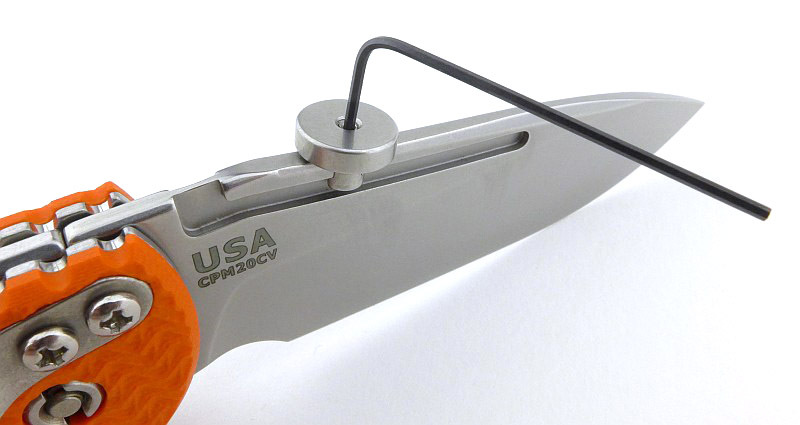 CPM20CV steel takes a super sharp edge (with ease – depending on your sharpener). 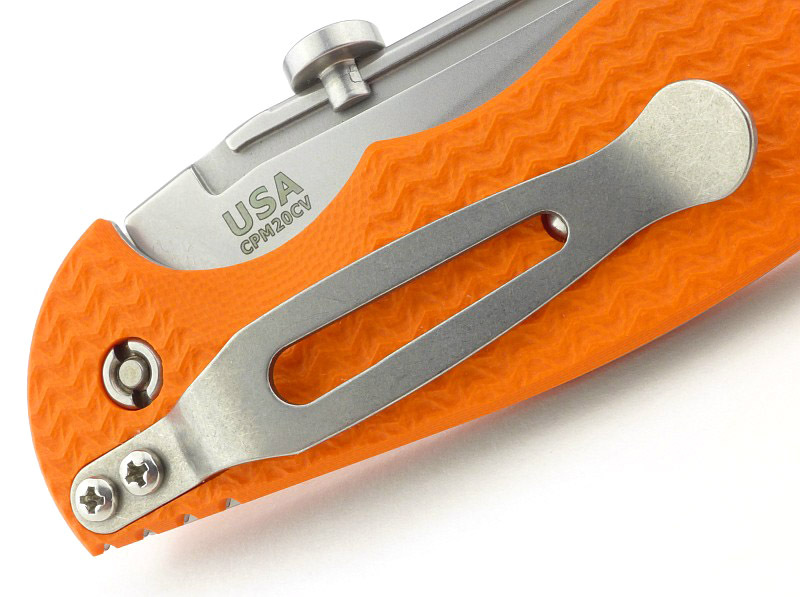 Pocket clip can be positioned for tip-up or tip-down use. Simple to replace/change handle scales.